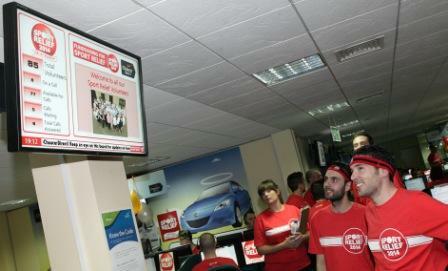 Chaucer Direct teamed up with a host of sports stars and over a 100 volunteers to help raise money for Sport Relief last week. An official call centre for Sport Relief, the Whitstable-based motor insurance provider was joined by Fijian rugby international fly-half, Nicky Little, Kent cricketers Adam Riley and Matthew Walker, Paralympian, Andy Barrow, and Olympic gold medallist, Sean Kerly. These stars of the sporting world joined 120 volunteers from Chaucer Direct and Chaucer Insurance on the companies’ phone lines, taking donations for the five-hour duration of the televised Sport Relief event. 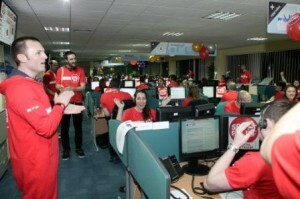 The atmosphere and team spirit in the call centre on the night was described by members of staff as ‘electric, energetic and positive’ while the ‘pulling together, comradery and friendly competition’ amongst all the volunteers made what was a long day for many, who had been in the office since 9am, more bearable. Spot-prizes given to volunteers who took the largest, smallest, fewest and most donations were kindly donated by Kent-based organisations including Kent County Cricket Club, Shepherd Neame, The Chair in Canterbury, The KM Group and restaurants Samphire, Zizzi & Beefeater in Whitstable. Catering was provided in part by Pizza Express and McDonald’s in Whitstable and any leftover food was given to the homeless of Canterbury. Be the first to comment on "Chaucer Direct do their bit for Sport Relief 2014"